Battery conditioning - still major cause of card lock ups. Do condition batteries out of the box 3-4 times before first use. Telltale sign for half life of battery is short available charge and low frame count before battery charge dissipates. Cameras include Canon 1D, 1d MarkII, 1Ds, Nikon D1h, and D1x. The cameras battery charge indicator is only letting the user know how much charge is left of what is chargeable in the battery. It doesn't measure overall chargeable room in the battery. I have had a battery die in the middle of shooting, and all my files were lost, even with "PhotoRescue", etc. Be careful. **** In severe weather, keep batteries close to body during cold weather, as warm as possible, this prevents battery freeze or chemical reaction from stopping and shortening normal battery charge. Formatting CF cards / Housekeeping - after long periods of use, CF cards will contain fragments from past use that are still on CF cards, because the camera's formats are very light formats and are not able to completely remove images. After retrieving all necessary images, wipe the card clean using a wiping utility from Image Recall, DataRescue, RescuePro, or other low level re-formatting utility on a PC every 6-8 weeks to insure fresh DOS format - format in FAT 16 only. To use Windows XP in Fat16, you have to drag down FAT bar and choose "FAT" for FAT 16....it will normally default to Fat32. After, re-format in camera before shooting. This will improve card performance overall. There is no way to do this on a Mac, except maybe using Virtual PC (no, I have not tried it). Have a copy of "PhotoRescue" or other image recovery utility available to insure image recovery if CF cards should lock up due to over shooting cards capacity or shooting on a low battery. Be sure that the user doesn't try to re-format the card before running any recovery utility, although recovering images is usually still possible after a format in camera. 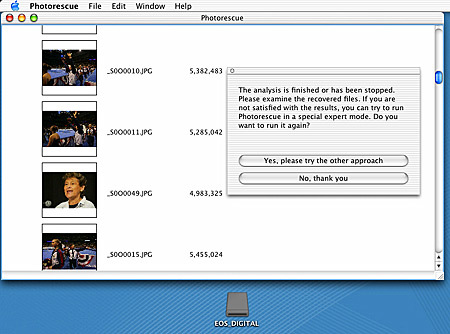 I've used "PhotoRescue" many times and it is amazing how it can recover images after a problem. Never choose the digital media card you are scanning as the destination drive! This will erase all recoverable data! San Disk includes a disk with "RescuePRO", for both PC and Mac, with their "extreme" line of CF cards. It has worked for Hanashiro where "PhotoRescue" did not. "RescuePro" is also available at http://www.lc-tech.com/rescuepro.htm for $40, and includes a wipe utility within. Keep the same group of CF cards with one camera system. Not a good idea to switch CF cards between different camera systems, although it can be done if card is first re-formatted in camera system that it will be used in. *Don't try to shoot beyond capacity of CF card, trying to squeeze out last few images to the CF card and "over shoot" CF card will cause the card to try to write the last images to unavailable memory thus corrupting the last few images and this leads to the CF card lock up. This typically happens when shooting combos of Raw and jpeg, very easy to loose count on how much capacity the CF cards has left. The card can be salvaged using PhotoRescue or Image Recall as long as the user hasn't tried to re-format the card. Remember that a 256MB CF card has actual only 249MB plus or minus due to the formatting and partitioning process which does use small amounts of storage taken away from available memory. Using a Canon MarkII on Raw+Jpg results in 19 frames available on a 340 Mb card! *Don't remove CF cards before camera is finished writing. This often happens when shooting raw images since they take longer to write. If you bang away on a MarkII or 1Ds for a while, be prepared to have a cup of coffee waiting for the disk activity light to shut off. It is advisable to wait a few extra seconds before turning the camera off or pulling the disk. *Don't remove cards from readers until properly dragged or manually ejected from reader depending on if is Mac or PC Windows system. It is good to wait a few extra seconds before removing the CF card from the reader after trashing or manually ejecting cards. *Don't mix CF cards between different camera systems. This can cause problems even with the same models of cameras. Remember, every camera is its own unique system. It can be done, but it is better to keep CF card to one camera system instead of swapping them around between different cameras. *Don't Wash, cook, freeze, expose to large magnetic fields, use as a dog toy, or otherwise treat the cards badly. They can withstand harsh environments better than older technologies, but be careful. Don't get into the habit of putting them into your pocket un-protected, especially with more flimsy SD cards coming our way.